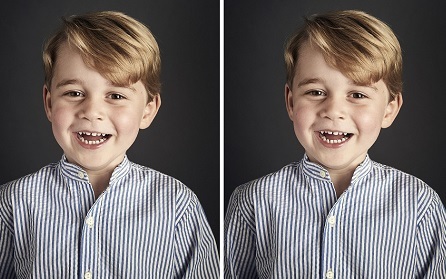 For a boy about to say goodbye to his toddler years and whose destiny is to be king, it is a first lesson in royal one-upmanship – and it won't be the last. After playing second fiddle all week to his younger, dazzling sister Charlotte, Prince George steps into the spotlight for his own close-up. And what a commanding performance he gives. Today is George's fourth birthday, traditionally a significant milestone along the road from infancy to boyhood. And to mark the occasion a new official photo has been issued by Kensington Palace.